Robert Graves (1895-1985) was a poet, novelist, critic, and classicist. He published more than 140 works, including Goodbye to All That, his classic memoir of World War 1, The White Goddess, a speculation on poetic inspiration, and the novels I Claudius and Claudius the God, which were successfully adapted for television. 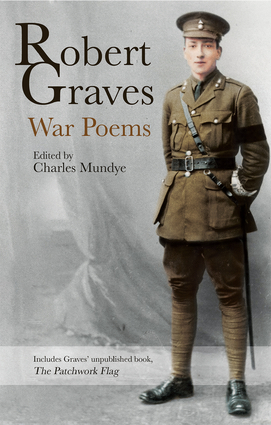 He was an officer in the Royal Welsh Fusiliers in World War 1 and was one of the first to write realistic poems about front line experience. He intervened on behalf of his friend and fellow officer Siegfried Sassoon when he faced a court martial, and suffered from 'shell shock', though he wasn't hospitalized for it. After the war he lived largely as a writer and was a significant and well-connected literary who influenced myriad writers directly and indirectly. His literary reputation remains high today. Charles Mundye is an English lecturer and Head of Academic Development at Sheffield Hallam University. He is the editor of Keidrych Rhys: The Van Pool (Seren, 2012), and has written on Graves and other poets of the period. He is currently President of the Robert Graves Society.